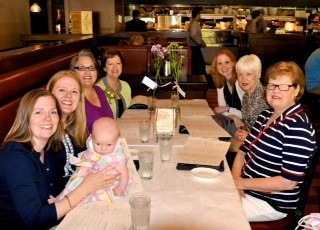 Every year Tara, Sarah, Amy and I try to get together with the mom’s for a Mother’s Day celebration. This year we were joined by the new lady in our clan, baby Emerson! We had brunch at Palomino in Bellevue and were lucky enough to be there at the same time as the Farrell’s, so we got to see everyone. It sounds like a very special event with very special people. Those long time friendships are one of the great gifts in life.